In talking with those who are not adult fans, I've realized that some people are not aware of all of the amazing building that is happening as you read this. And so, another new semi-regular feature will be added to the lineup, The Brick Round-Up, in an effort to direct those interested towards other blogs that highlight great builders and outstanding LEGO creations. 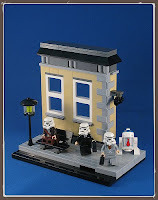 If Stormtroopers had day jobs... [via The Brothers Brick]. There are sets, and then there are motorized carousels that feature riders moving in a circle and up and down [via BrickJournal Journal]. A review of the set, Ole Kirk's House, a gift for those who took the Inside Tour at LEGO in Billund, Denmark [via Brick Town Talk]. A periscope is just the tip of a submarine [via VignetteBricks].